Determining a home’s value is not easy. The biggest misconception in real estate is that every home has its price. This idea is simply not true. Even appraisers, who have extensive training to evaluate homes will not agree. If you paid ten appraisers to determine price on the same home on the same day each opinion will be different. We’ve all heard this phrase. It means to buy something that is worth less than you thought it was. Determining a home’s value is one of the biggest struggles for buyers of real estate. For sellers, the reverse, being underpaid, is true. Both buyer and seller wonder how they can protect their best interests. A mistake with this product could mean 5% – 20% of value or even more. This is why determining a home’s value is extremely vital. Understanding the value proposition gives both buyer and seller a benchmark to make wise decisions. It is not a decision to be left solely to your agent. The biggest misconception in real estate is that every home has its price. This idea is simply not true. Even appraisers, who have extensive training to evaluate homes will not agree on the value. 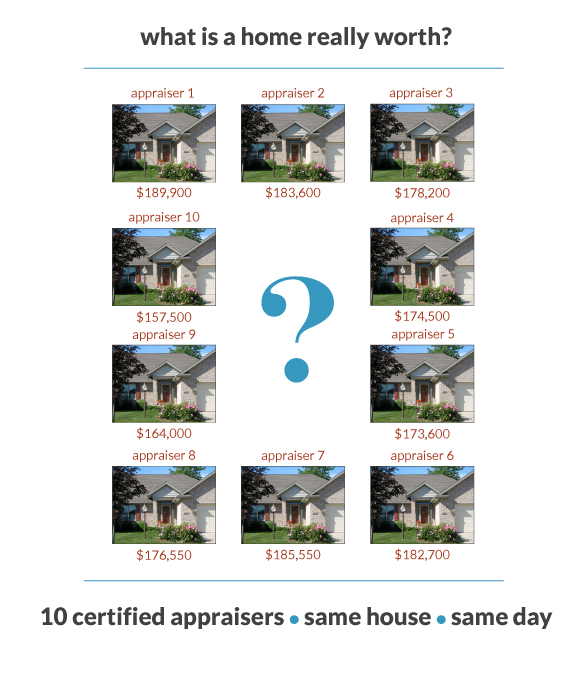 If you paid ten appraisers to determine price of the same home on the same day each opinion will be different. The real truth is that every home has its price range. We often struggle and negotiate hard to find the right price when there is more than one right price for every home. There is a complete home value range for every home. Your goal is to assure yourself that you are within that range of value. In addition to your own investigation and efforts, there are resources available to assist in determining a home’s range of value. The two most common resources used by buyers and sellers are the “broker price opinion”, or BPO, and an independent appraisal by a fee appraiser. Also known as a “competitive market analysis” or CMA depending on location. A properly completed BPO or CMA will examine and report on all five of the considerations listed above. Your agent will gather and analyze the information and render an opinion of value for a particular home. This information is presented in the form of a written document. You should look at the features of the comparable properties and be prepared to challenge the agent’s analysis and judgment. While their familiarity with the current market conditions and individual properties lends credibility to their opinions, they are just opinions. BPOs properly prepared by a knowledgeable agent can provide an accurate home value range. Your agent should be ready and willing to discuss all aspects of their BPO. This instrument is offered for sale based on the intended use or purpose of the work product. There are various reasons for appraisals and they are prepared on a variety of forms. The more details the report reveals, the more it will cost to prepare. Costs can range from $150.00 to $450.00 depending on the market you live in, the type of appraisal you require and the credentials of the appraiser. The appraiser will analyze the same five considerations previously identified above. When reviewing an appraisal or broker price opinion, be prepared to challenge the validity of the comparable properties and the appraisers analysis and judgment. It is a mistake to accept the estimator’s opinion without taking the time to examine and understand it. There are a number of differences between a fee appraisal and a BPO. For the purposes of discussion in this writing, the main differences are the fee appraiser specializes in appraising property rather than selling it, the appraiser has little or no conflict of interests, and the appraisal is provided with a cost to you. The other significant factor to consider is the purpose of the fee appraisal. Is the purpose to confirm to the lender that their loan is secure? Or is the purpose of the appraisal to give you guidance on what to offer for the home? The appraiser is responsible to the party that engages the appraiser, regardless of who pays for the appraisal. For example, when you pay for an appraisal in your mortgage loan closing costs you are paying the appraiser to tell the lender if the lender’s proposed loan is secure. In the case of home mortgage loans, the appraiser is working for the lender. Another real estate myth is the municipal property assessment as a reasonable indicator of the fair market value. The purpose of the municipal property assessment is for the purpose of taxation and is not necessarily intended to be an opinion of current market value. I have rarely seen property sell for the assessed valuation. It is either more or less, and it can be a lot more or less. View it as the least reliable source of value information. The best information regarding a home’s value comes from experienced sources that have done the research and documented their results. Individual perceptions and hearsay without the factual backing causes confusion and misrepresentation. A true understanding of a range of home value is gained from analyzing the five considerations above. To some extent, the time and energy you invest in each home you view in your search becomes a part of your experience. A excellent way to gather home value information before you list your home is to attend open houses of similar homes in your neighborhood. A side benefit of this activity is observing agents at work. By gathering up relevant specifications about the open house it will assist you by providing you first hand information on what will be a comparable property when agents are evaluating your home. Experiencing the gathering of this information will add confidence to your review of the experts opinions. There is a lot more to say on home pricing. For those that find home valuation a fascinating subject, Click here to go back to real issues that sellers encountered on this step.